Former BBC 5 live presenter Allan Robb has died at the age of 49. He had been suffering from multiple sclerosis. 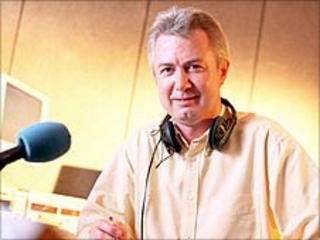 The broadcaster, who fronted the station's Midday News for several years, began his career at Aberdeen's Northsound Radio. At the BBC, Robb covered stories including the death of Princess Diana and the dawning of the Millennium. Childhood friend and 5 live host Nicky Campbell called him "a great broadcaster and professional". "It's one of the saddest days of my life," he added. Campbell said he was proud of his job at the BBC: "He pointed up to Broadcasting House and said 'we work there for the BBC'. He never forgot that." Robb was also a presenter on Radio 1's Newsbeat programme and on BBC Radio Scotland during the course of his career. Atholl Duncan, BBC Scotland's head of news and current affairs, said Robb would be "fondly remembered by his many colleagues on Reporting Scotland as an extremely professional presenter and a highly skilled and tenacious journalist".